Worcestershire's opening County Championship match of the season at home to Kent is still to get started at New Road after being rained off for the second day running. After Sunday's first day abandonment, the ground was further drenched by overnight rain, leaving pools of water around the sodden outfield. Having ruled out play before lunch, the umpires inspected again at 12:45 BST. With the water table still so high, play was then called off for the day. Echoes of nine years ago . . .
For Kent supporters - and a good number have travelled north for this fixture - the match already has echoes of 2007 when the four-day County Championship fixture between these teams was abandoned at New Road without a ball being bowled. While the current problems have been caused by rain, the situation nine years ago was entirely different. Kent were the first visitors to New Road following the flood of July 2007, when the decision taken to try and play the game proved to be the wrong one. 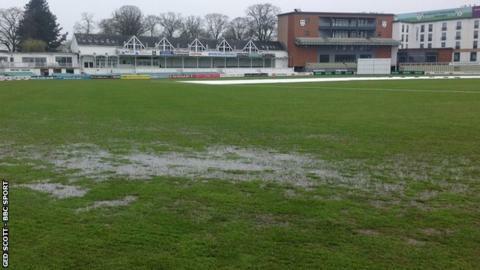 Worcestershire took a risk in going ahead with the fixture only 12 days after the ground had suffered its second worst flood, having been left under water to a depth of almost 16 feet. It misfired badly and, following further heavy showers, the match was abandoned on what should have been the third day. Another attempt was then made to get New Road ready for the game with Lancashire a fortnight later - but it poured down for 24 hours, the ground flooded again and that game was abandoned too. Worcestershire ended up spending the rest of the season away from flood-damaged New Road, playing 'home games' at various grounds around the country, including Taunton, Derby, Edgbaston and chiefly at Kidderminster.